It’s a Mystery, Unless it’s Not. There is no question learning about God involves coming face-to-face with mystery. A Bible in your hand and questions in your head don’t guarantee all the answers you seek will come to light. Indeed, this is the Supreme Being of whom Romans 11:33 declares, “Oh, the depth of the riches and wisdom and knowledge of God! How unsearchable are his judgments and how inscrutable his ways!” This probably means, among many things, some of the answers we are seeking from God about God may remain a mystery in this life. I know I’ve bumped up against the mystery of God in my own journey. How does it work with Jesus being fully God and fully man? How does God’s sovereignty work with man’s responsibility in salvation? Why did God allow Bro-country into the world? Mysteries one and all. However, and this is important to get if you’re serious about matters of faith, you don’t get points for saying something is a mystery in the Scriptures if those Scriptures are clear about that something. Too often I hear people refer to something about God or Christianity as a mystery when the Bible is clear in its answer. Parroting that response is disingenuous to real seekers of truth. It’s as cheap as debating an issue where you’ve only cut-and-paste content from a Google search while acting like you researched the subject thoroughly. Neither is honest or helpful. Frankly, saying something’s a mystery (when it’s not) could simply be a backhanded way of rebelling against God’s Word because we don’t want to have to deal with the straightforward teaching of Scripture – that it’s either too demanding of us, too against what popular culture embraces, or makes us too different than we’d prefer. That’s no way to seek after God. It only gives the illusion of seriousness when the truth is we don’t want to know or accept the truth. Let’s be clear for seekers and believers both, don’t be dishonest in searching for answers about God, man, and everything else in the Scripture. You will face mysteries and you will face things that aren’t. 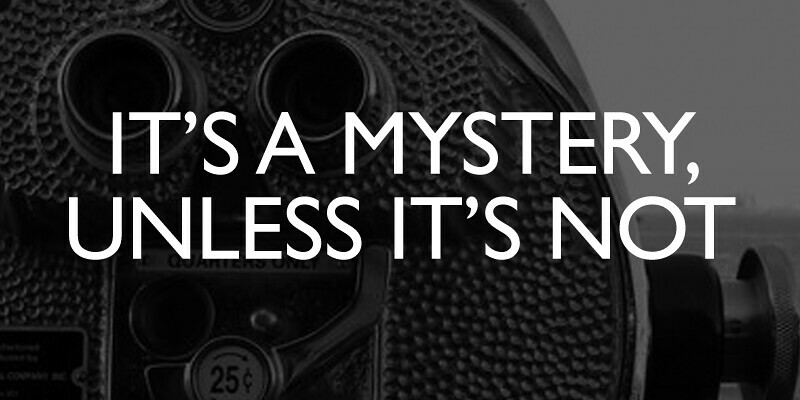 So, it’s only mystery when it’s a mystery. If it’s not, then it’s a truth to be embraced.